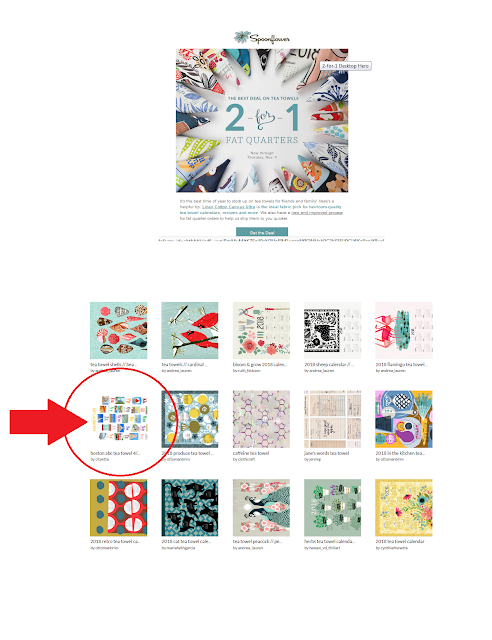 cityette - ABC Boston: 2-for-1 fat quarters at Spoonflower! 2-for-1 fat quarters at Spoonflower! It's our favorite time of year at Spoonflower - the 2-for-1 fat quarters sale! Fat quarters are awesome for making tea towels on the linen-cotton canvas fabric, or for using as the front side of a throw pillow sham or for many, many other things - the sky's the limit! We use our kids' drawings to make fun, colorful, durable, and beautiful throw pillows in the play room and when ordered during the fat quarters sale, these are so affordable! It's also perfect timing to start thinking about getting Spoonflower orders in so that you have ample time to stitch up your DIY projects before the holiday crunch time is in full effect. We don't want to spoil any surprises so we won't say exactly what we'll be making this year, but we always gift Spoonflower to our friends and family and it's such a fun treat to go to our friends' homes and see our pillows and tea towels on display and being put to good use. We don't get paid to advertise for Spoonflower, so this is coming from our own tried and true experience. Shop over 600,000 designs (including 60+ of our own designs) on spoonflower.com! 2-for-1 pricing is in effect through November 9! Check out our ABC Boston tea towel that's sized specifically for fat quarters and available for only $6 and change during the sale!